Sometimes Biblical stories just get a bad rap…young and old alike want to hit the snooze button just looking at the Word of God. Yet there are so many amazing stories, more thrilling than an action movie and more dramatic than the steamiest soap opera. All of these stories also happen to encompass amazing lessons and truths of God. 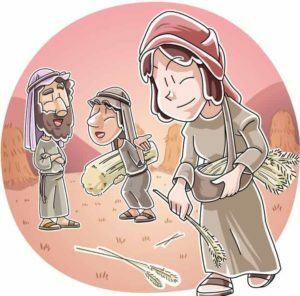 This lesson covers insightful highlights included in the book of Ruth. This first lesson covers the “part one” of the story, opening up what becomes an amazing romance. Lesson focus: God wants us to be loyal and faithful to our friends and family; even when things seem challenging, He will work things out for good. Don’t miss our Ruth and Naomi Coloring Page. and the Story of Ruth teaching video. Lesson Opening: Gleaning Game…have a relay to practice “gleaning” like Ruth did. Can you separate it? Prepare containers of hay, scattered throughout with peanut shells and/or peanuts (use a different item if allergies are a concern). Allow students to pair up or team up, and race to locate the nuts within the hay. Have stickers or small treats for winners (but make sure everyone gets a chance to win…). Explain that today’s story will feature an old practice called “gleaning,” which means picking up bits of wheat and hay after other people have harvested. Another element of what students just did was trying to separate things that might be tough to get apart. Today we will also be talking about things that stick together without separating. When it comes to friends and families, God wants us to stick more closely than hay to peanut shells! Use your best judgment as to the approach of this lesson. More than likely, you can read through the whole first chapters with the students. For especially young or wiggle-prone crowds, it may be better to summarize, story book, or even act out the action. This lesson will cover the first portion of the book, leaving off at the meeting of Boaz. Set the stage by explaining to students the excitement of the story, and the significance of its echoing into the life of Christ and salvation representations. Describe (and/or read) the first part of the story. When Naomi heard in Moab that the Lord had come to the aid of his people by providing food for them, she and her daughters-in-lawprepared to return home from there. 7 With her two daughters-in-law she left the place where she had been living and set out on the road that would take them back to the land of Judah. After some resistance, Orpah finally agreed and left. However, Ruth was determined to stick with her Mother in Law. She refused to leave her side, and in so doing took a great step of faith and courage. By accepting Naomi, she was agreeing to follow her culture and God. She was at risk of not ever getting married or having society standing again. But she was faithful to Naomi. So Ruth gleaned in the field of Boaz, and Naomi was quite pleased when she heard about it. She told Ruth who Boaz was, and knew they would be cared for. Family ties were important in that time. If someone was in trouble and needed help, family members had obligation to take care of them, even if they were not related by blood and even if they had never met the other person. The “redeemer” aspect meant that Boaz was saving Ruth and Naomi, literally taking their shattered lives and helping to put them back together. So since Ruth showed faithfulness to God and her family, and wouldn’t leave Naomi, God took care of them. But what happened with her and Boaz?? Well, tune in next time to find out! Make a necklace (or hanging decoration) to remember family and friends in our lives. Have students select a bead or a noodle for each person in their families. Provide string and help (if necessary) to thread the beads and noodles on. Encourage them to use these to pray for loved ones, and to stick to them like a string to a noodle! Close with prayer and gratitude for special people in our lives. Ask God for faithfulness and quality relationships with others. If desired, allow students to take some souvenir hay to remember the story, as well. Tony Kummer (Editor) reviewed & updated this page on : February 19, 2019 at 10:38 am. All our content is peer reviewed by our readers, simply leave a comment on any post suggest an update.